I was away when someone asked if I had seen the ‘On Becoming…’ video on You Tube. I immediately looked for it and I must say when I watched it I didn’t understand what was coming. I thought perhaps there was going to be a reality show on Toke’s life and adventure moving on. I however didn’t have to wait long as about two days after I got a message from Toke and an invitation to the Book Launch. I had to leave the launch early and didn’t get a copy of the book but spoke to my daughter the next day and she said she read the book the night before on iBook and couldn’t put it down. I immediately sought to get my copies. (Old fashioned me prefers to read books the traditional way of turning actual leaves). I picked up the book on Saturday morning and I didn’t put it down till I finished. This meant all I had to do on Saturday apart from my hair, which I could do whilst reading got cancelled. Her style of writing makes the book very interesting. I actually love the chapter where she describes her growing up the most. I was able to visualize all she describes and I could actually picture all the characters in my head. Her love for her father and his love for his family was so real. It made the bizarre accident more painful as you realize the incredibility of how it actually happened and how that could have been avoided. Going into my kitchen that late night was not easy I must say. 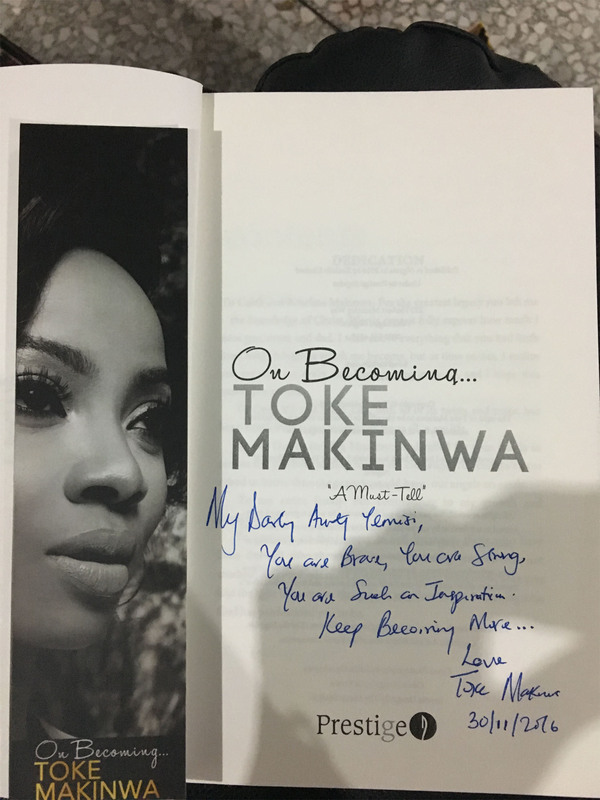 The way Toke was able to describe her journey thereof to date including meeting her husband to her marriage collapse in a way that bore no judgment or bitterness was also one I could never have envisaged. I feared when I read excerpts of the book that it would be a written pay back, but nothing could be farther from the truth. It describes her vulnerability and many times her gullibility regarding her lover and you could see through the journey her weaknesses and why she was easily taken advantage of. As loving and generous as ‘Big mummy’ and her family are it is only natural for anyone having to grow up with relatives, having grown up in such a loving environment as Toke describes to have some complex. It is one also that is difficult to explain away without sounding ungracious considering the circumstances. I realized that ailed Toke though was actually not the many other women at all but a feeling that she was not good enough. She tells how he told her his family did not think she was good for him because she wasn’t from the sort of background they could recognize. What sort of background is that? Orphans? They only lived round the corner from each other. Many women fail to understand that in society women move on the social strata through birth or through marriage and they feel that when a man comes from a more financially superior background or was born and schooled abroad whilst they were born and reared here in Nigeria then they are too good for them. I have heard it too many times. It was this thought that made Toke always feel privileged to have this man and she was always trying to belong, be accepted, and be allowed in. In his case he was always philandering and he hurt her emotionally but she would have taken anything he offered, be it drugs, alcoholism or even physical violence. It takes an emotionally mature and enlightened man to find a woman for himself and on what he has to offer not what his family have. Otherwise he himself is always trying to belong and man up in that family and unfortunately cannot offer such a woman much succour. What I also enjoyed about the book was that Toke showed her great faith in God. She shows that it is cool to have God in your life and counts her many blessings. Nothing happens without a reason and I feel she has her husband to thank because in trying to be accepted she worked hard to be successful and it paid off! Had they stayed together however they could have been the magic couple thanks to her. David Beckham was a fantastic football player but with Victoria’s panache and her obsession with his looks she created the brand he is now. He earns much more in endorsements than he did playing football. But alas it wasn’t to be. In conclusion this was a book that had to be written. A story that had to be told. Toke has a great followership. Women of all ages for different reasons have an interest in her. Some to check if the skin lightening is true, some to know if she is hiding behind her Vlog when totally unhappy in her own relationship, some want to look like her, some want to know why and if it is true she’s paid to make appearances, some want to know this TM everyone is talking about. I hope these women learn from the story. They need to learn that Toke rose up when she started to think about putting Toke first. To know when to walk away when love is not feeling like love anymore. This was a very brave move and I am very happy it is paying off. Many of us have stories to tell, which if told so honestly would make a difference but for whatever our reasons we have not plucked up the courage. She is our inspiration. Well done Toke, God bless you Big Mummy.